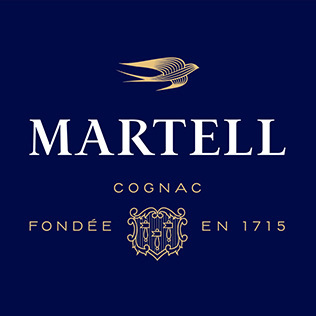 Martell - one of the oldest cognac houses - has been creating fine cognacs with passion and knowledge since 1715. 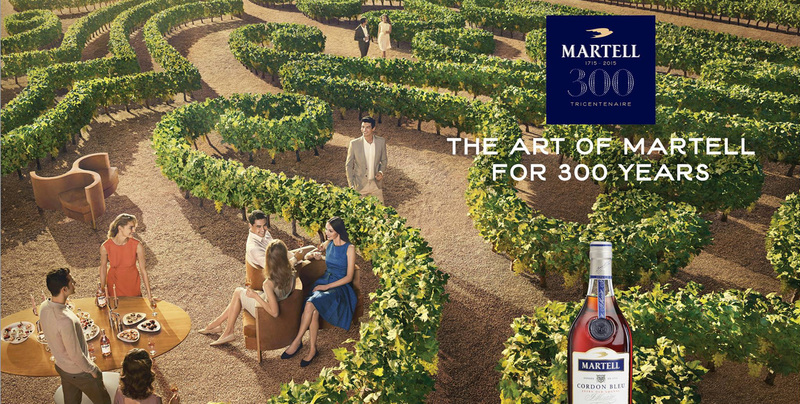 Over 300 years of history, Martell has inspired true gentlemen through the beauty and pleasure of every moment celebrated with spirit treasure named cognac. 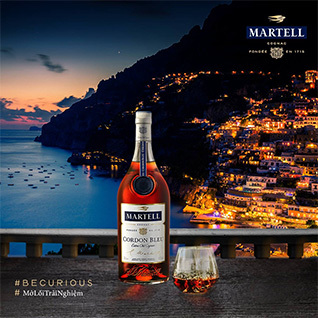 Martell Noblige - the elegant indulgence of the contemporary taste which spreads the message "Be Curious": Only those who seeks experiences discovers the best in everything. "Be Curious" generation who has curiosity in their blood are invited to experience a new perspective of social gathering: the H.O.M.E - House of Martell Entertainment. Via the campaign, young targets should be inspired to explore to enrich their experiences with the extraordinary place. Our mission is to approach young wine-consumers in Vietnam market and show them how to enjoy the famous elegant French cognac. The campaign gained good attention from offline & online potential customers: Over 30.000 engagement & 500 thousands reach by re-targeting on social. "Be Curious - Come H.O.M.E" viral clip with special optical treatment got over 150.000 views. 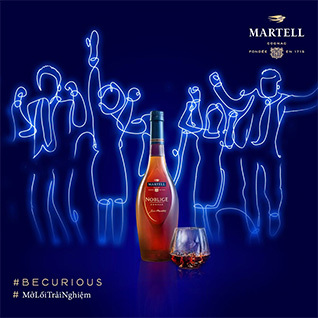 Martell's key message: "H.O.M.E - The place where curious minds belong" was embed with every activities we made: from viral clips, activation events to engaging activities. The distinctive door made with neons lights are wisely inserted in every communication activities as we invited users to "Open and experience yourself". Optical illusion & other sosphisticated yet mordern art have been used to bring out curiosity in T.A, provoking their inner thrist to live, to discover & enrich themselves. The video tells the journey of an invited guest who followed a mystery girl and experienced Martell H.O.M.E. With a code deciphered from the Martell invitation card, the door opened a new, exciting hallway which lead to most exotic, well-served party. At the beginning, we post about "H.O.M.E", which educate users about Martell spirit & products, take the most amount. Coming after is Activation since this on-ground activity has been kicked off in November & ended at the end of the month. 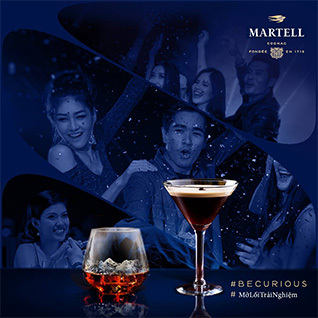 After Tet, posts focus on Martell Cordon Bleu & Martell Noblige, which are about branding & providing information of Cordon Bleu & Noblige, as well as the engaging post to help gain interaction. 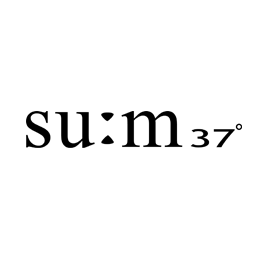 su:m37° - a luxury cosmetics brand from Korean that is famous for their precious and unique "naturally fermented" skin-care secret. Through the art of fermenting and the touch of time, the rare herbs & finest ingredients have become dedicated extract: lessen toxic and allergies, easier to absorb and nurture your skin from the inside. 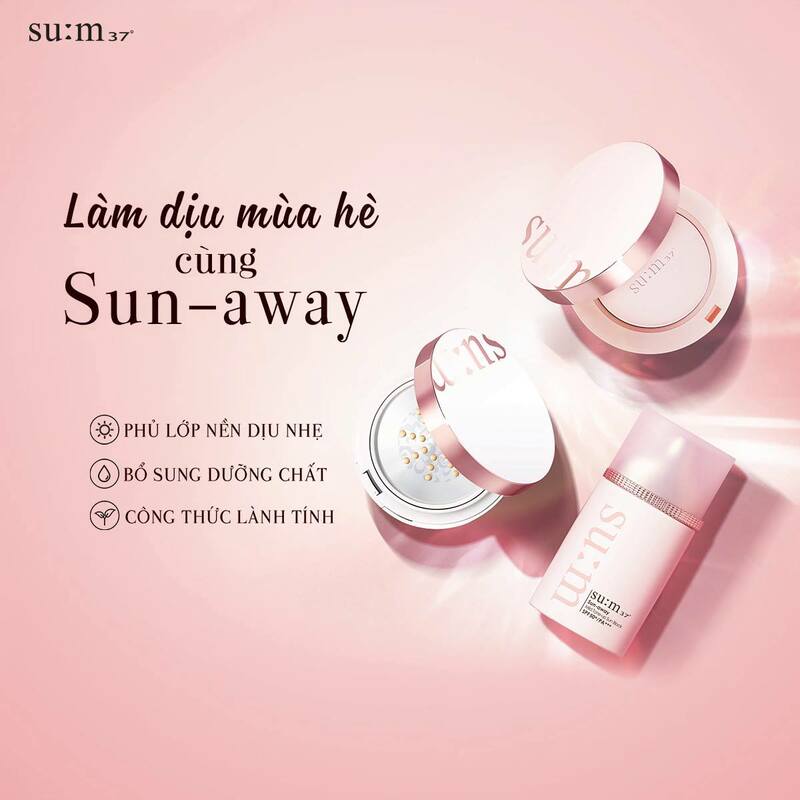 In Vietnam, su:m37º launched 9 product lines: Secret Essence, Air Rising, Dear Flora, White Award, Skin Saver, LosecSumma, Secret Repair, Sun-away and Water-full - each has different advantages to indulge in. As "fermented cosmetics" is quite new to the market, our mission is to educate users on the benefits of naturally fermented method, especially remarkable proprietary Cytosis formula. 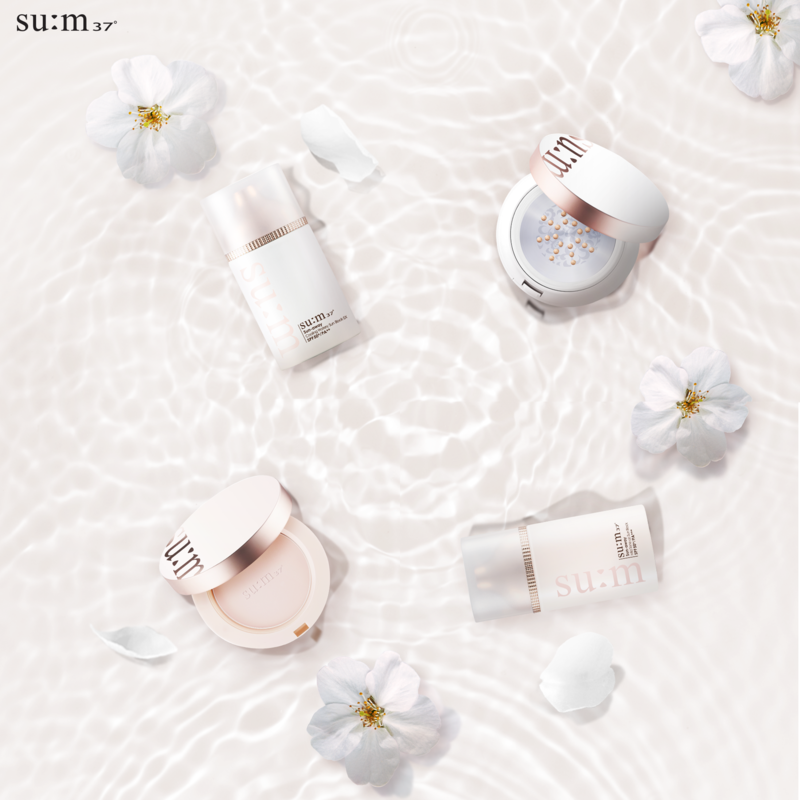 As each product contains different precious ingredients and benefits, the 3 core product lines as well as their unique selling points should be well-introduced: Secret Essence Cushion, Bubble-De Mask and Sun-away. 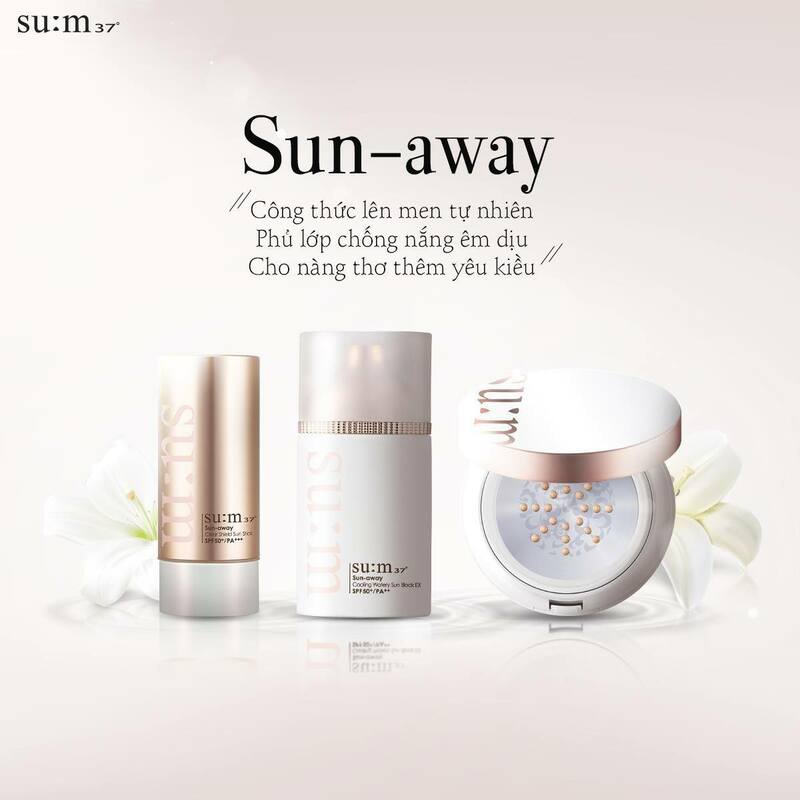 From the core ingredients that made each product, we formed a vivid picture for each product lines from their strong advantages: Secret Essence cushion which is inherited from the well-known Secret Essence, Effortless Detoxifying exprerience with Bubble-De Mask & the Worry-free Sun-away product line. Despite the differences, 3 products were depicted with significant poetry and dedicated writing style, as well as clean & bright designs. Secret Essence cushion - a breakthrough solution in cosmetics which benefits in both ways: perfectly cover from the outside and nurture your skin from the inside. Secret Essence cushion inherits Secret Essence most precious recipe: the powerful Cytosis extract fermented with over 800 herbs & ingredients your skin can indulge into. 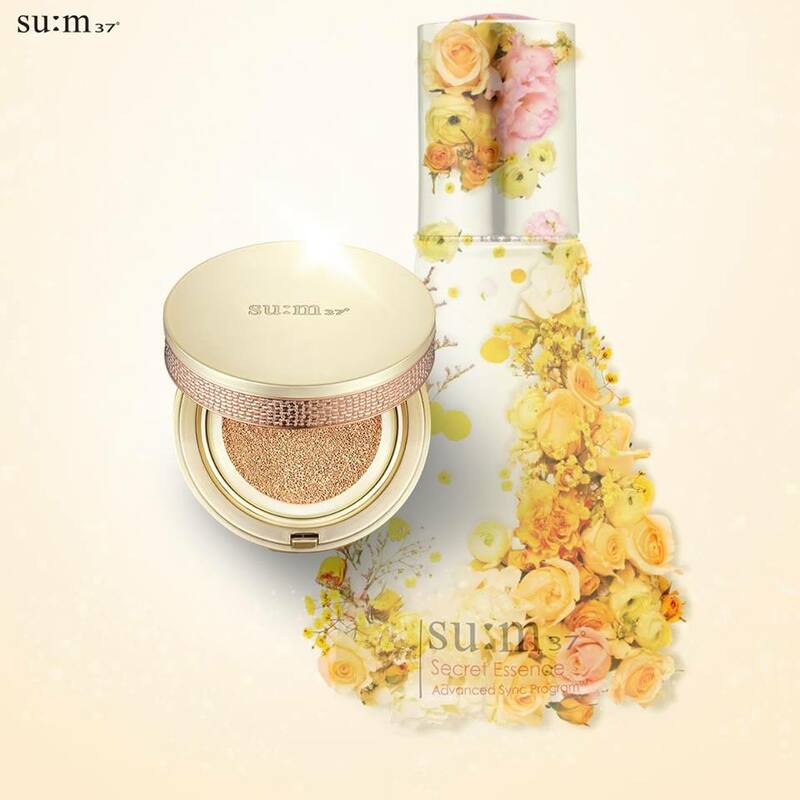 - Bubble-De Mask Pact: including and white mushroom, suitable for mixed skin type. - Bubble-De Mask Black: including black quinoa, "black diamond" mushroom and charcoal, suitable for dry skin type. Bubble-De Mask Duo allow a 10-minute home-spa: take away dirts then leave your skin clean and well-prepared for next skin-care step. Chỉ trong 2 tuần, su:m37 đã nhận được tình cảm và sự quan tâm từ hơn 5.000 nàng thơ khi đăng ký trải nghiệm thanh lọc làn da mùa hè cùng Bubble-de Mask - mặt nạ sủi bọt được yêu thích nhất tại Hàn Quốc. Nàng đã thấy làn da được thanh lọc và tẩy sạch độc tố cùng bã nhờn, để da sạch khỏe, sáng bừng trong vắt như nàng hằng mơ ước chưa? Cùng comment bên dưới và chia sẻ cùng su:m37 nhé! 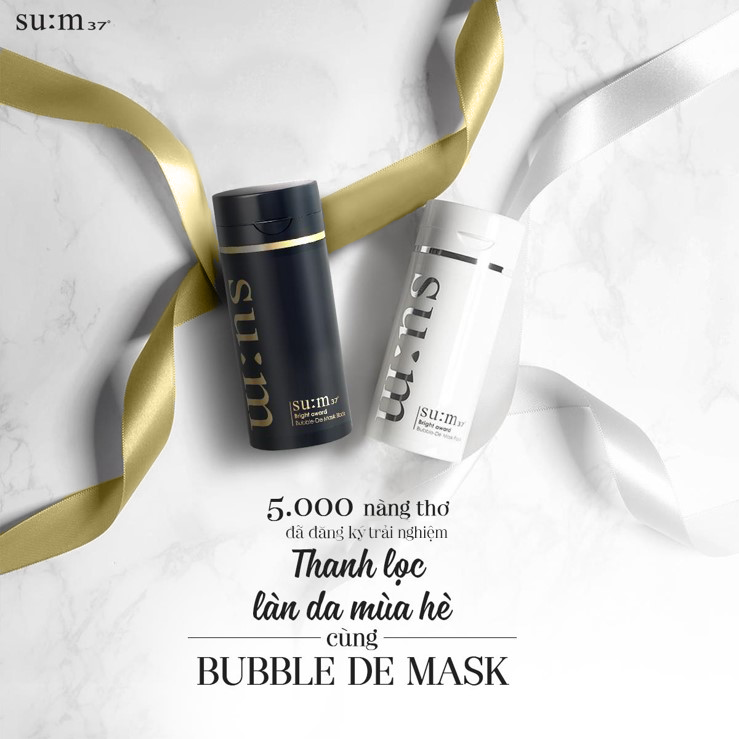 Nếu nàng đã bỏ lỡ chương trình Thanh lọc mùa hè cùng Bubble-de Mask, thì hãy theo dõi Fanpage @SU:M Vietnam và chờ đón những món quà sắp tới từ su:m37 cùng "nam thần" Lee Jong Suk trong mùa hè này nàng nhé! Tặng mình 10 phút thư giãn với mặt nạ sủi bọt Bubble-de Mask và trải nghiệm "làn da thủy tinh“ như Hoa Hậu Đặng Thu Thảo nàng nhé! Lớp bọt khí li ti từ bộ đôi mặt nạ Bubble De Mask nhẹ nhàng lấy đi mệt mỏi, trả lại làn da căng mượt, mịn màng. Chạm khẽ vào làn da dịu mát, nàng có thấy hè này trong veo? "Sun-screens are sticky, allergic and even dry my skin!" Now you have to worry no more with Sun-away products. With four different types to serve all purposes: from light cover for daily use, to matte for perfect cover and sun-protection. Sun-away is loved for its strong protection from both UV and fine dust, as well as the ability to nurture and brighten your skin. 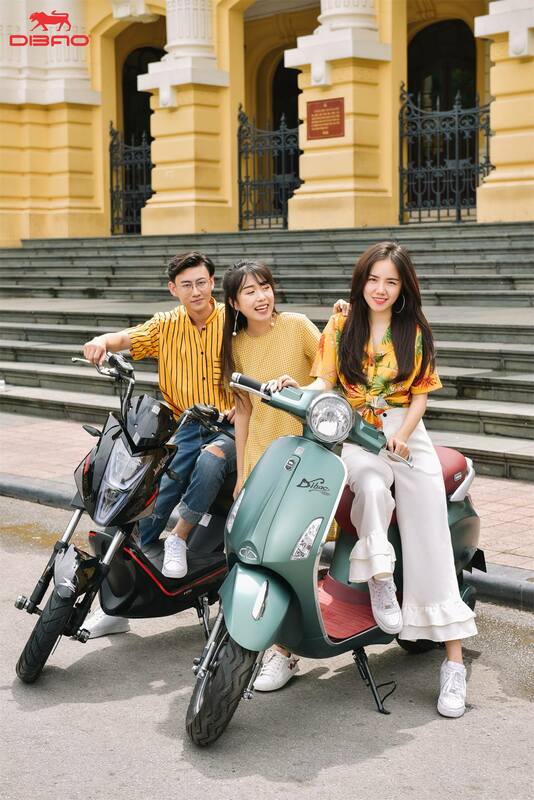 Tan Thanh is one of the top 6 companies selling electric bikes in Vietnam. The best-selling products of Dibao is known for imitate the design of premium scooters . 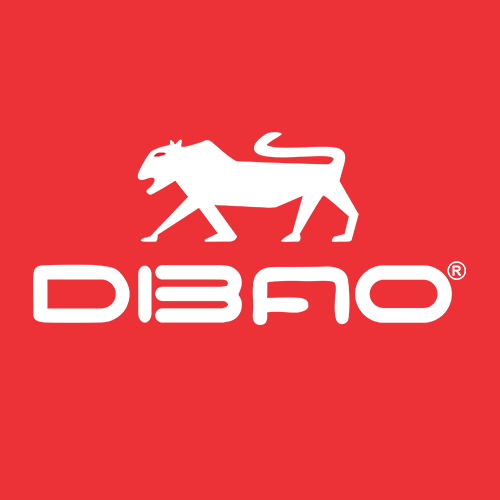 In May - Aug 2018, the company wants to raise brand awareness of Dibao & engage with its target audience, catching the peak season of Summer & New School Year which supposedly takes place since W4 May to boost sales in its whole distribution network. The campaign gained good attention & fondness from teenboys & teengirls: Over 3 million reach & 200k engagement on social. "Sành điệu chính hiệu hot teen" viral clip with special optical treatment got over 500k MV views. Kicking off the campaign by a photo album of Phương Ly & friends having happy bonding together with Dibao. Following up is the short MV starring Phương Ly singing "Mặt Trời Của Em" - one of her hit song - with re-written lyric. Social content on Dibao's fan page as well as KOL & comic pages play a big role in supporting & speading out the key message "Dibao - Sành điệu chính hiệu hot teen". 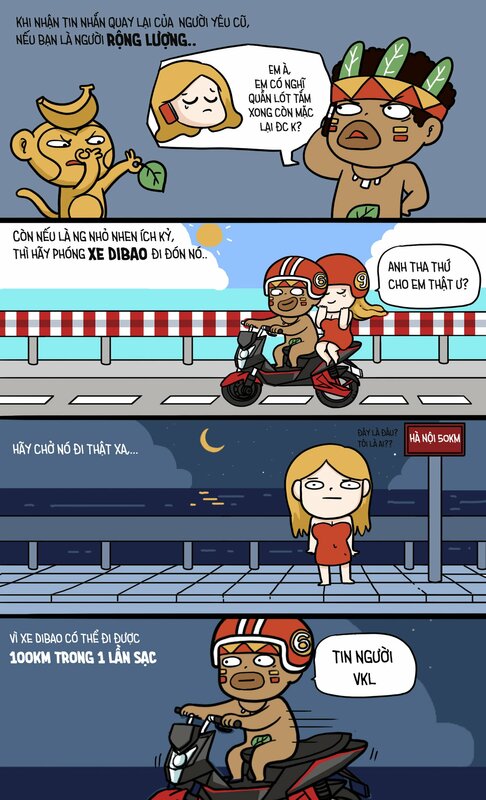 We rewrite the lyric of Phương Ly's hit song "Mặt Trời Của Em" to tell how Dibao be a very good friend of teenagers and make them feel like "hot teens". Happy & young Phương Ly & friends enjoy hanging out on Hanoi Street. Riding Dibao, they well attract attention from other teens & make them wanna be in the squad. 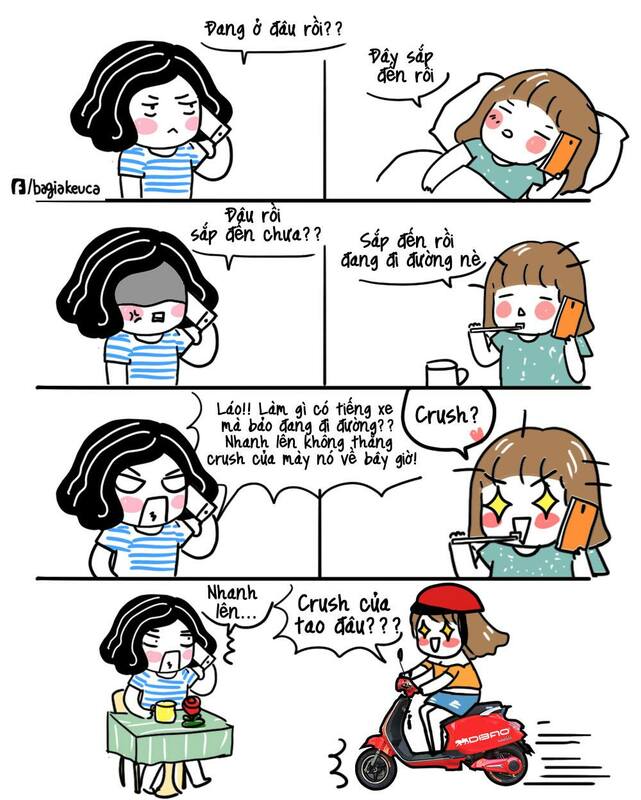 Phương Ly helps share the short MV while 3 hot comic pages create fun content about Dibao. Grab is a technology company that offers the ride-hailing, ride sharing, and logistics services through its app. The communication to drivers is scattering regarding segmentations, channels and key messages. In 2018, Grab wants to communicate with drivers with one single theme "You can have the abilities to do lots of things when you become Grab's partner". Starting from the insight that most of drivers has their own goals in life, whether big or small, long-term or short and Grab always shares the opportunities with drivers to empower them towards their targets. 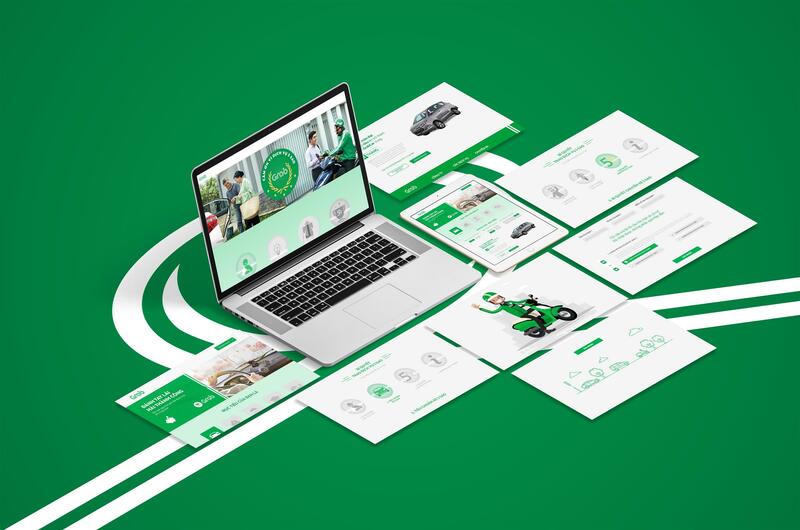 We came up for big idea: "when you TURN THE WHEEL with Grab, you can easily GRAB THE GOALS". To visualize the idea of “Turning the wheel – grabbing the goals”, we have a series of 6s clips, which highlight the quick, positive impact on drivers’ life once they choose to collaborate with Grab. To celebrate the International Women's day, Grab carried out an interview in which female drivers share about their work, life after joined the company. Via the clip, people can understand how hard our female drivers have tried, as well as send out a statement: Not only men can become driver, but also women. Rewards Grab partners with TOP performance with a luxury holiday. 70 selected drivers from Ho Chi Minh, Da Nang & Ha Noi enjoyed their trip with friendly atmosphere, cheerful colleagues & well-planned trip to highlighted spots in Singapore. BlueStone, premium home appliance supplier from American Corp., brings comfort and convenience, making house works become more enjoyable for women and enable them to enjoy other aspects in life. To create curiosity & attention to the “Nội trợ lên tay, hăng say vào bếp” brandsite & contest, we interview target audiences about the fact: Is it true whether there are solutions to help free women from housework to gain fully happiness? To build an effective and friendly brand image with emotional approach as viral element, through the real experience as well as the starring guest - Alain Nghia, Iron Chef Vietnam 2014, the viral clip state that: The best food is the one cooked with love, not just with the best ingredients. Clips & photos of cooking tutorial for daily & Tet recipes using BlueStone products. The investigation of a kid to find out his mother’s secret helper to make good food. BlueStone as a gift for the warm & lovely family anniversary. 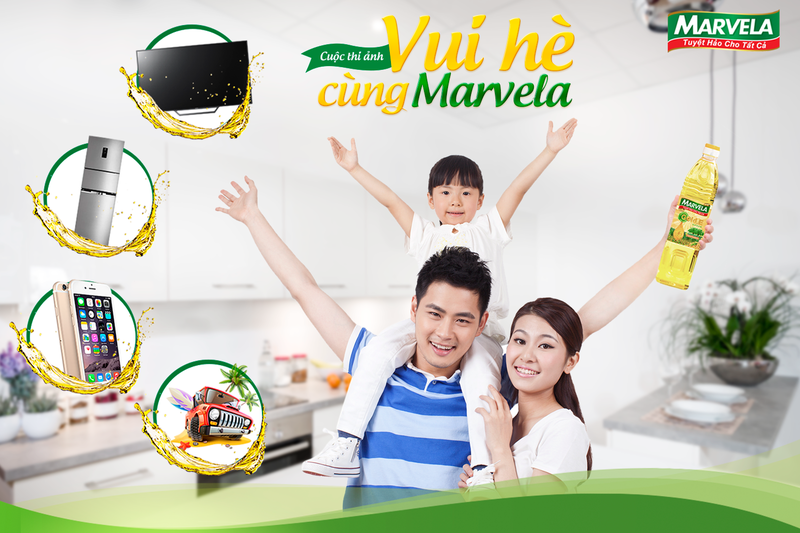 Marvela is a cooking expert consults consumers how to choose a good cooking oil for appetizing & nutritious dishes to take care family’s health, as well as a nutrition professional to consult consumers in being a smart and modern housewife. 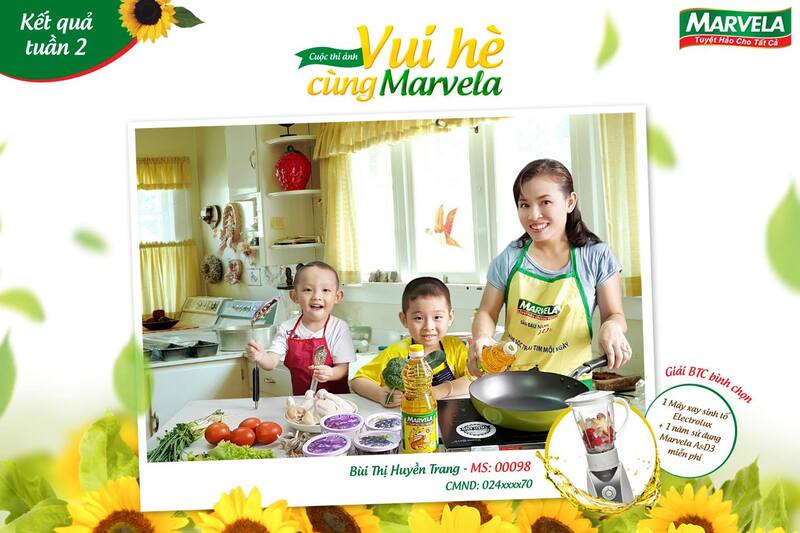 Starting the campaign with the introduction to Marvela A&D3, we launched the Poster campaign about the importance of family meal in which Marvela presents as a friendly expert of nutrition, then a Contest for homecooks to show their knowledge about cooking. Ending up with a viral clip, the campaign made a strong impact about thanking the woman who cooks for her beloved family eveyday. Following the last year story about the "Marvelous woman for fabulous family", this year we mainly focus on the love & care of Marvela woman for her child. 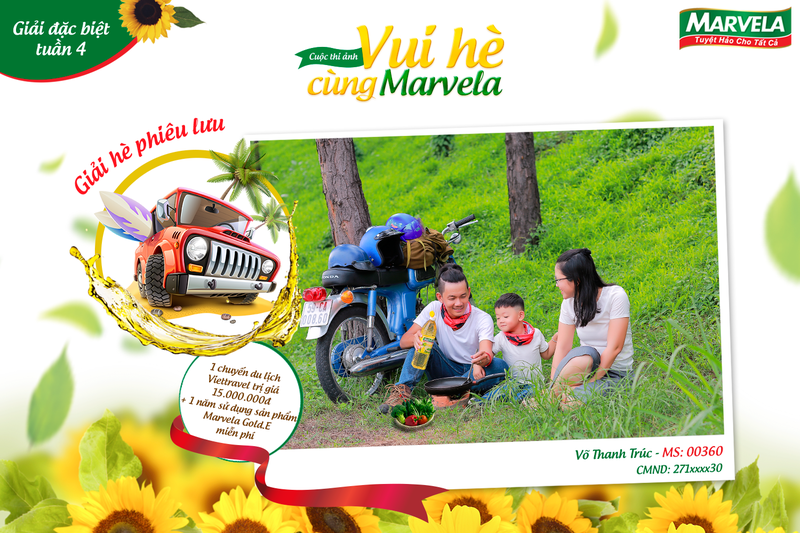 A Poster campaign kicked off, following by are the Contests "Vui hè cùng Marvela" & "Bé vẽ gia đình", which all reflect the tight bonding of healthy & loving family members. Viral clip "Marvela - Thay lời yêu thương"
Starting by a small survey, which leads to the result that 90% of interviewees don't know the favorite dishes of the woman who cooks for them everyday. So, it's good time for gratefulness to be sent. Offline products display was a part of the production material. 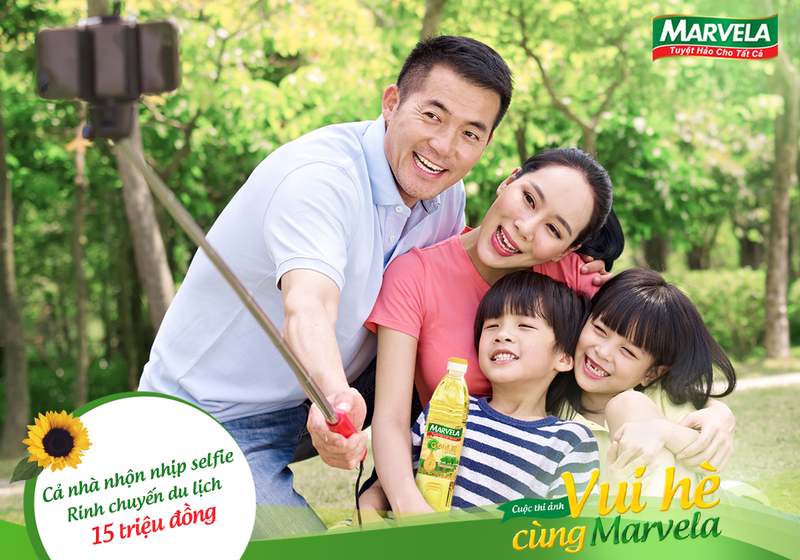 Users submit photos of happy family moment together with Marvela A&D3 to win valuable prizes. 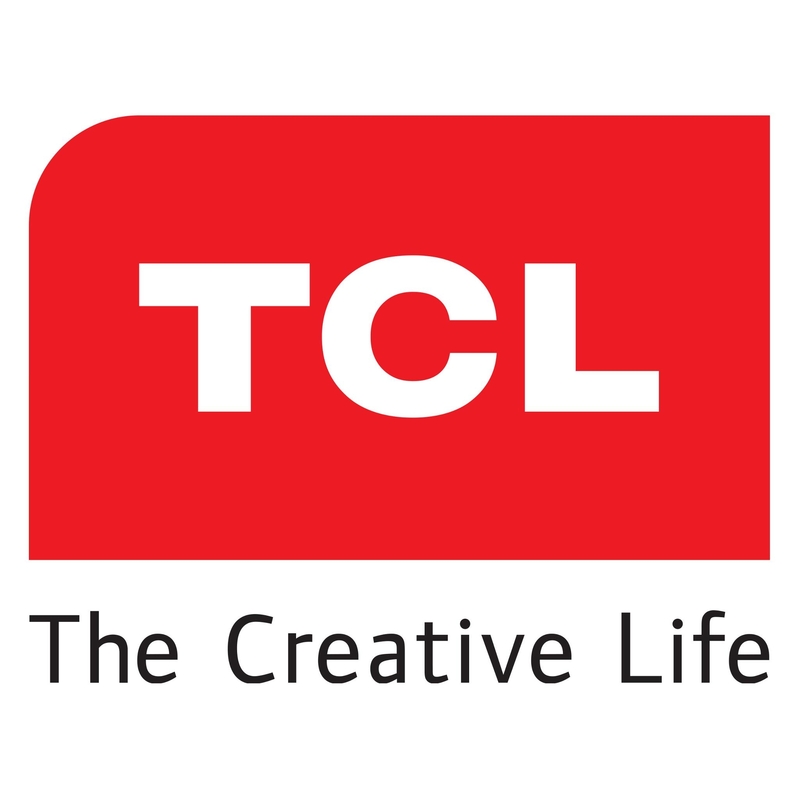 TCL Corporation is a Chinese multinational electronics company headquartered in Huizhou, Guangdong Province. It designs, develops, manufactures and sells products including television sets, mobile phones, air conditioners, washing machines, refrigerators and small electrical appliances. In 2015, TCL Vietnam was launching the TCL Z1 television which is the cooporated product of TCL & Zing and the friendly member of Vietnamese families. We kick-off the campaign by spreading out the importance of family bonding & ways to have it in busy life on social, and humanizing TCL Z1 into 2 aliens - Zingky (green) & Tingky (orange) - coming to earth to help a human couple. 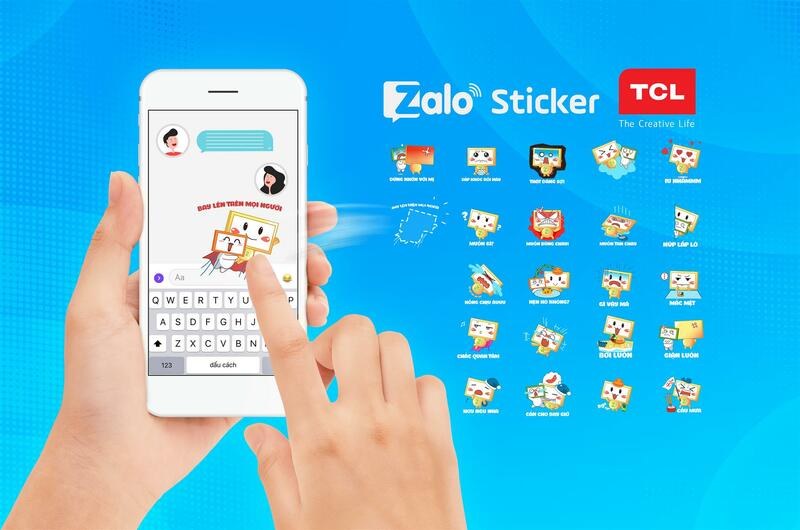 Their amazing story, which was told on social content & Zalo stickers, leads to the product launching event with the atendance of press, families & VIP guests. Ti & Zin are a just-married couple. They have the opposite personalities but one thing in common that they spend most of time on smartphone all day. Even a little dog – Fefe feel unhappy because of the family bonding moments fewer day by day. So that Zingky – a cute alien from Happy planet decided to come the Earth to help Ti & Zin’s family together. Since then, Zingky become a important character in this family. Zingky comes from Happy planet, accidentally crashes his spaceship into the planet Earth, right at Ti & Zin’s home. He notices that Ti & Zin family only spends time with their personal devices, lacking of family bonding moments. Dưa Leo talked about happy moments of family gathering in front of the TV in the past and present, and mention the TCL Z1 launching date. Then, 50 Real Accounts share Dưa Leo viral clip, zingky sticker post, Pre-order site and talk about the coming TCL Z1 launching event & call to pre-order product with huge benefits. Following the winning product TCL Z1 in 2015, TCL Vietnam proudly launched the TCL Z2 - the upgrade version of TCL 1. For home is the place for peaceful moments, when all family members gather having dinner and watching TV together. 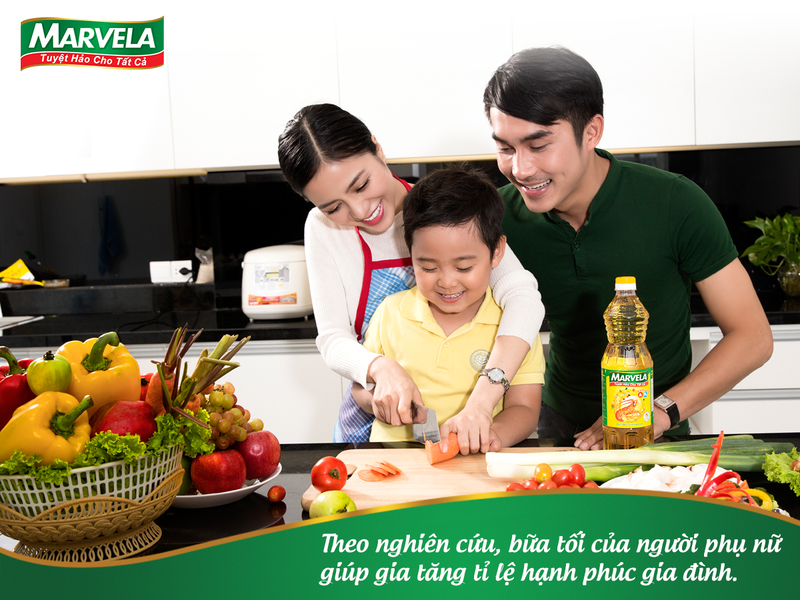 Z2, with mission thes same as Z1, will continue to help bring the real bonding moments to Vietnamese families. After a year, people are get more separated from each other, Zingky & Tingky really need help with connecting people on earth but they’re too busy. 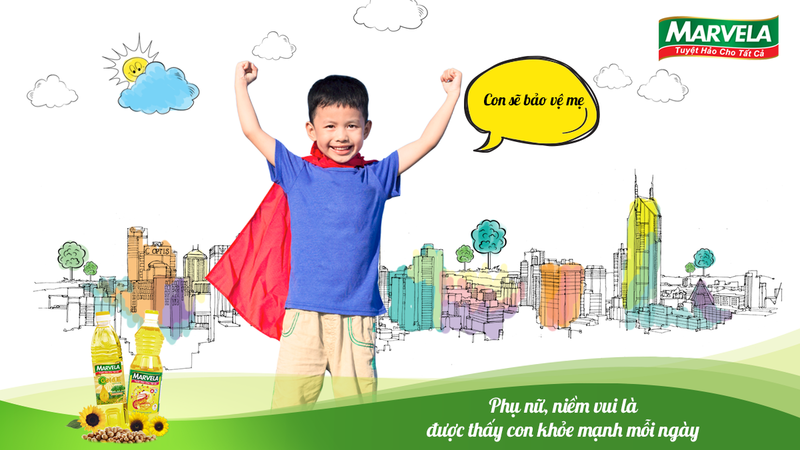 Z2 was born to continue the mission: create real bonding moments for Vietnamese. This guy is more advanced designed with spectacular skills such as freezing time, flying ect., plus more energetic & funny. Song & MV "Về nhà vui hơn - Min"
For example: A couple are arguing, Z2 freeze time & adjust their movements like holding hands, kiss each other, put the Z2 TV on the room ect. , to heal their relationship. 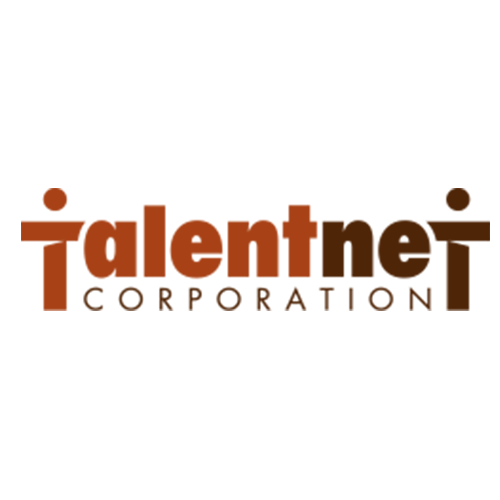 Originating from the Human Resources Services unit of PricewaterhouseCoopers Vietnam, Talentnet is now acknowledged as the leading HR consulting firm in the country, with nearly 20 years experience in the local labor market. With the vision “Make a difference in the lives of every employee”, Talentnet is passionate about contributing to a better working life for Vietnamese employees through professional HR solutions designed to meet the diverse needs of Vietnamese and international clients. Lien'A has over 30 years of expertise in producing premium latex using its proprietary formula and sttongly believes in continuous innovation and constantly incorporates newest technology and design in its products. 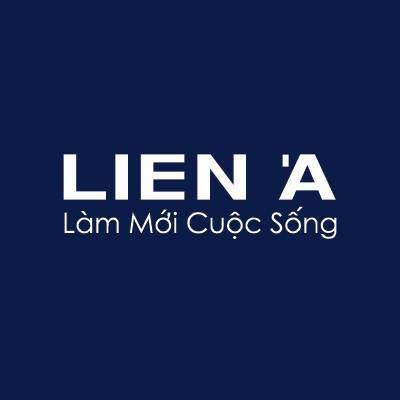 Today, Lien'A continues to satisfy the diverse demands of its customers both in Vietnam and across the world through quality products and excellent customer service. Since its inception in 1995, Acecook Vietnam Joint Stock Company has been developing dramatically and becomes a leading manufacturer of foodstuffs in Vietnam. Acecook Vietnam, attained a strong position in the market while providing instant processed products with high quality. The campaign is going-on, receiving good attention from online customers. 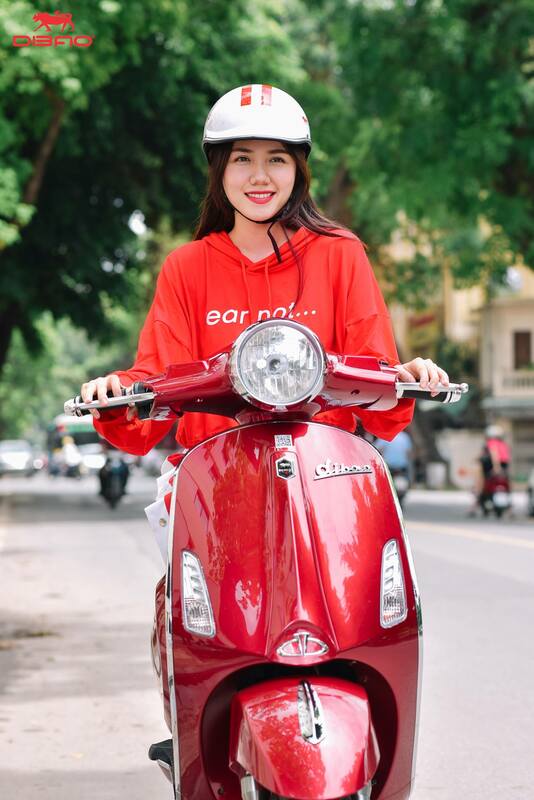 Starting from the concerns that instant food is not good for health, we kicked-off a campaign to correct consumers’ misperception based on delivering the content about the production process of instant noodles on ACECOOK Vietnam fanpage. At the same time, we also use the fan page to spread out ACECOOK's message "Cook Happiness". Visiting the factory is important in Acecook’s chain of consumer interaction activities. So, we produce the clips captured the production process of instant noodles with the most modern technology, to create products of Japanese quality, ensure food safety and bring peace of mind when using. Acecook Vietnam is one of the brands of instant noodle which take the large market share in Vietnam. 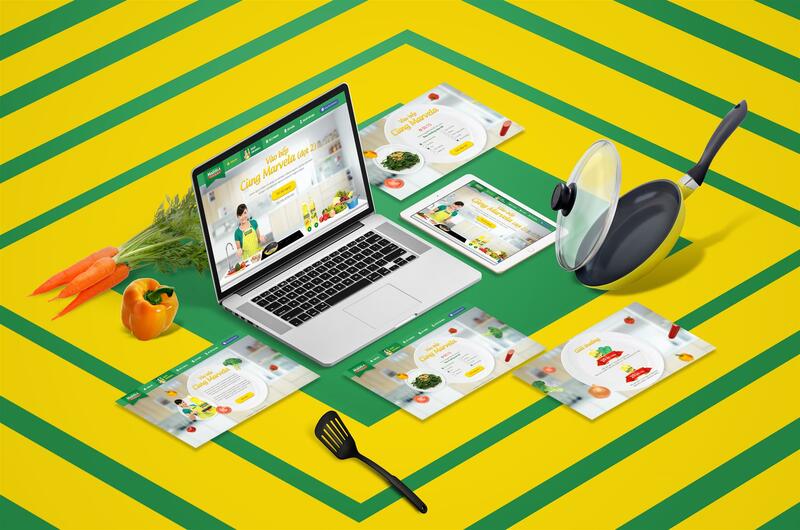 Official fan page: officially launched since September in 2017 with variety content and image, regularly updating information about brand and communicating the key message “Cook happiness”. This is also where Acecook responds to consumers about the products next to the main website and hotline number. - Convey message “Cook happiness” with 3 “happy” target: Happy consumers, Happy workers, Happy society. 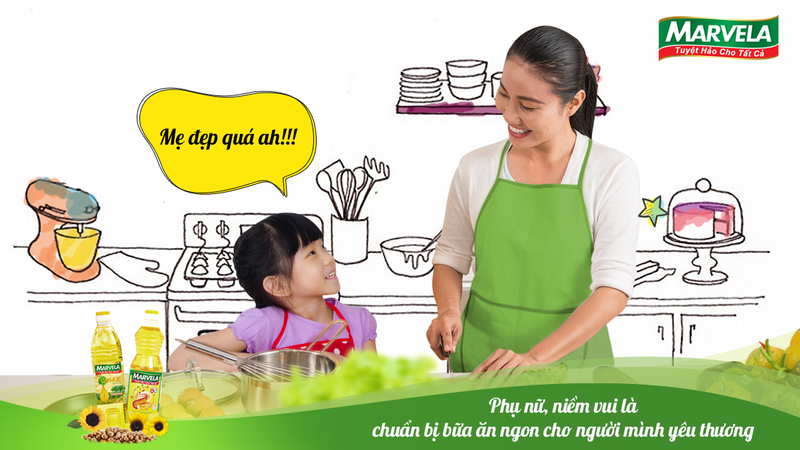 - Attract consumers (housewives and family) to visit the Acecook Vietnam factory. Happy Tour is one of the most focus on ground activitites of Acecook Vietnam. In 2018, Happy Tour marked the number of 20.000 people signed-up. They are housewives, retired employees, students who are looking for a reality experience activity. Happy Tour opened in 3 main factories: Hochiminh City, Vinh Long and Hung Yen from South to North of Vietnam. Base on the Acecook Vietnam's marketing objective for 2018, we create a social content plan to help solve these issues: stronger educate about noodle which include noodle culture, ingredients and recipes; fix the misperception about noodle; build a new image for Acecook Vietnam which associate with convenience and delicious benefit for consumers. All of the event information, CSR and brand's activities was fully deliverable thru the content angles to build Acecook Vietnam's image. Bạn có biết: “mái tóc” vàng óng ả của Nu-đồ có khoảng 190-200 sợi. Để giữ suối tóc luôn đẹp rạng rỡ, sau khi hấp tóc với hơi nước để tạo độ óng ả, cô nàng còn có thêm 2 bí quyết “dưỡng tóc” yêu thích: Chiên với dầu thực vật trong khoảng 2.5 phút hoặc sấy khô trong 30 phút. Bạn có biết: trước khi đến tay người tiêu dùng, "binh đoàn" nhà mì sẽ phải qua quá trình kiểm tra chất lượng khắt khe. Những thành viên không đạt "chuẩn" khi chiên: vắt mì vàng không đều hoặc bị bể nát, không đảm bảo trọng lượng quy định sẽ được phân loại, nghiền nát tại nhà máy và bán cho các công ty chuyên về sản xuất thức ăn gia súc để tiếp tục hành trình của mình. 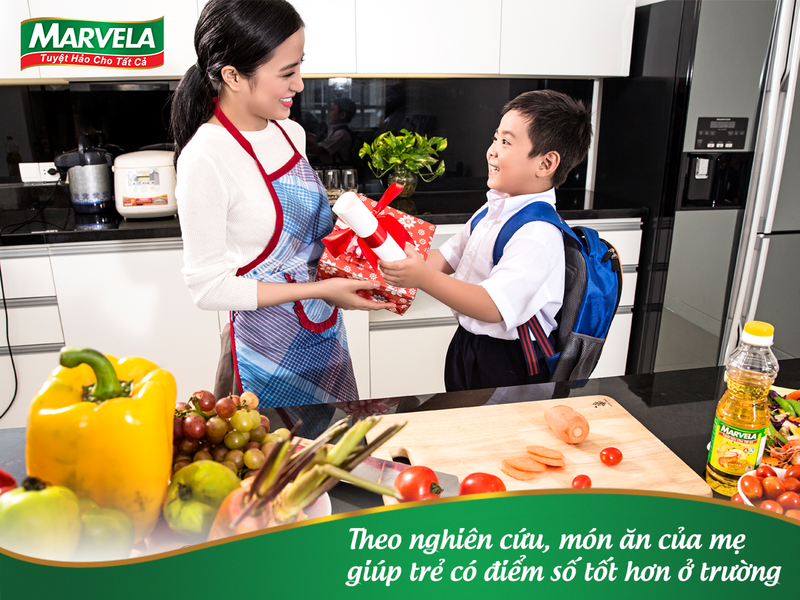 Người tiêu dùng có thể yên tâm mọi sản phẩm bán ra thị trường của Acecook đều là những sản phẩm được tuyển lựa kỹ càng và hành trình của “binh đoàn” nhà mì dù đi đến đâu vẫn trọn vẹn mục đích phục vụ cộng đồng của Acecook. Lưu ý thêm là bạn nên bổ sung thêm nhiều rau xanh để tăng lượng chất xơ hấp thu vào cơ thể, đồng thời có chế độ ăn uống, kết hợp dinh dưỡng phù hợp để quá trình xử lý thức ăn trong dạ dày được khoa học và phù hợp với cơ thể nha. Hiện nay, không khó để bắt gặp những từ khóa như: "Sử dụng mì ăn liền gây ung thư". Điều này đã gây ra nhiều hoang mang cho người tiêu dùng. Vậy thực hư câu chuyện này như thế nào? Chuyên gia cho biết: chất “có thể sinh ung thư” khác xa chất “gây ung thư” (như khói thuốc lá, chất thải công nghiệp, khói xăng dầu, tia tử ngoại…) nhưng nhiều người vẫn thường lầm tưởng là một. Chất có thể sinh ung thư chỉ biến thành chất độc, tạo điều kiện để tế bào bình thường biến thành tế bào ung thư khi có điều kiện thuận lợi của rất nhiều yếu tố khác nhau như hàm lượng “chất có thể sinh ung thư” cao vượt mức cho phép, sức đề kháng yếu, khả năng đào thải độc tố của gan và thận kém, lối sống phản khoa học. Hiện nay trên thế giới chưa từng ghi nhận kết quả nghiên cứu khoa học nào đủ tin cậy để khẳng định mì ăn liền gây ung thư. Tại Acecook Việt Nam, các thành phần nguyên liệu và phụ gia sử dụng, đều phải đảm bảo tuân thủ các quy định nghiêm ngặt về nguồn gốc xuất xứ, hàm lượng cho phép của pháp luật Việt Nam về an toàn thực phẩm được cơ quan chức năng cấp phép lưu hành và giám sát chất lượng. Vì vậy, thay vì lo lắng trước những thông tin thiếu căn cứ, bạn nên chú ý tới chế độ dinh dưỡng cân bằng và vận động hợp lý. Khi ăn mì gói nên bổ sung thêm rau, hải sản, thịt (heo, bò, gà), cá, trứng,… Ngoài việc ăn uống đủ chất, cần có chế độ sinh hoạt lành mạnh, tập luyện đều đặn mỗi ngày, tinh thần lạc quan mới chính là cách bảo vệ sức khỏe, tránh xa các nguy cơ bệnh tật trong đó có ung thư. MÌ ĂN LIỀN CÓ PHẢI LÀ MÌ RAMEN, ĐỐ BẠN BIẾT? “Mỗi lần đói là nhớ đến mì gói đầu tiên.” Nhưng liệu bạn có biết hết về "thân thế" của người bạn này? Một trong những thắc mắc về mì ăn liền mà nhiều fan thường gặp là: mì ăn liền có phải là mì ramen, điều này vừa đúng nhưng cũng không hoàn toàn là vậy. Năm 1958 trong một lần tình cờ, cha đẻ của mì ăn liền đã dùng mì ramen chiên lên để bảo quản được lâu và món ăn toàn cầu này đã được ra đời từ đó. Nói chính xác, ramen chính là tổ tiên của mì ăn liền ngày nay với thành phần nguyên liệu làm từ bột lúa mì. Tuy nhiên, mì ramen mà ta thường thưởng thức trong nhà hàng Nhật với nước dùng sánh đậm được làm từ sợi mì tươi đặc trưng , còn mì ăn liền thì đã qua công đoạn chiên để bảo quản. Trên tô mì ramen tươi là những thành phần không thể thiếu như trứng lòng đào, thịt, rong biển, hành xắt sợi. Còn mì ăn liền thường được ăn kèm với xúc xích, kim chi, trứng chiên tuỳ theo sở thích người dùng. Thêm một kiến thức về mì là thêm một lần yêu với món ăn quốc dân này. Còn bạn, bạn ấn tượng điều gì nhất về mì ăn liền nào? Không cần phải đến Nhật để thưởng thức mì udon mà ngay ở Việt Nam, bạn đã có thể tự tay chế biến món ăn "quốc hồn quốc tuý" của xứ mặt trời bằng mì Udon Sưki Sưki từ Acecook. Cùng Nu-đồ vào bếp nào! - Luộc sơ cà rốt thái sợi mỏng, hành lá rửa sạch xắt mỏng. - Bật lửa lớn, đun sôi 300ml nước, nếu chín vắt mì Udon Sưki Sưki cùng các gói gia vị trong vòng 5 phút, trút mì và nước dùng ra tô. - Thêm trứng, cà rốt, rắc hành lá lên trên và thưởng thức ngay khi còn nóng. Lưu ý là mì sẽ ngon nhất nếu bạn chế biến đúng thời gian ghi trên bao bì nhé. Cuối tuần rồi, "đổi gió" với mì Udon nha bạn ơi. Cô mì có một phương châm: "Không xuất hiện thì thôi, đã ra khỏi nhà là phải lộng lẫy!" Quyết tâm sống đúng tuyên ngôn cuộc đời, Nu-đồ luôn sẵn sàng bên người "vũ khí quyến rũ" đặc biệt: Dầu gia vị 100% thiên nhiên. Gói dầu gia vị được chế biến từ dầu tinh luyện cùng các nguyên liệu tươi và thơm ngon như hành hương, tỏi thơm, ngò ôm, ớt cay nồng... giúp cô nàng tự tin "tỏa sáng" giữa đám đông. Luôn năng động tràn đầy sức sống, thân thiện với hương thơm quyến rũ - Bảo sao Nu-đồ đi đến đâu là gieo thương nhớ đến đó! Acecook Việt Nam cam kết 100% sản phẩm khi đến tay người tiêu dùng đều là những sản phẩm đạt tiêu chuẩn chất lượng và đảm bảo an toàn sức khỏe. Dù là phát minh của người Nhật nhưng với người bạn láng giềng Hàn Quốc, mì ăn liền lại là “món ăn quốc dân” vô cùng được yêu thích bởi người dân nước này. Theo thống kê của Hiệp hội Mì ăn liền Thế Giới (WINA), năm 2017, trung bình 01 người Hàn Quốc tiêu thụ 73,7 phần mì/năm, xếp thứ nhất về mức độ yêu thích mì ăn liền. Người Hàn Quốc thường chế biến mì kèm các nguyên liệu từ thịt hộp, xúc xích, giá đỗ đến là lạ một chút như cá cơm, sữa, phô mai… và đương nhiên không thể thiếu vài lát củ cải muối hoặc kim chi. Và điểm đặc trưng nhất của văn hóa ăn mì Hàn Quốc chính là ăn trong nồi. Dù trong phim hay ngoài đời thường, bạn cũng sẽ dễ dàng bắt gặp hình ảnh họ nấu mì trong chiếc nồi nhỏ bằng nhôm và cùng nhau xì xụp thưởng thức mì, đôi khi còn tận dụng luôn nắp nồi để đựng mì. Còn các fan nhà mì, fan nào là "tín đồ" phim Hàn hãy kể tên những món mì ăn liền của Hàn Quốc mà bạn biết nào! Comment bên dưới nha! Bên cạnh các đại diện khác như Miss Ramen đến từ đất nước mặt trời mọc - Nhật Bản, miến Japchae đến từ xứ củ sâm - Hàn Quốc, mì Pad đến từ xứ chùa Vàng – Thái Lan Bánh mì, thì chúng ta cũng có một đại diện nổi tiếng không kém cạnh gì đó chính là món Phở mà người nước ngoài nào khi nghe nhắc đến món ăn Việt Nam chắc chắn sẽ muốn thử một lần. Độ nổi tiếng thì không cần phải bàn cãi rồi đúng không nào, thậm chí Phở Việt nổi tiếng được yêu thích tới mức được trang trọng dành cho một danh từ riêng trong từ điển tiếng Anh Oxford là "Pho" để gọi. Và đây cũng chính là một trong những niềm tự hào mà chúng ta có được để giới thiệu cho bạn bè Thế giới biết được, nền ẩm thực của Việt Nam thật đặc sắc và thú vị như thế nào. NÓNG BỎNG TAY VỚI MÌ CAYKAY - BẠN ĐÃ THỬ CHƯA? Cơn sốt của anh mì SiuKay đang khuấy đảo giới trẻ còn chưa hạ nhiệt thì người anh em CayKay đã vừa được tung ra để thoả mãn sở thích của những tín đồ mê cay. Như mọi sản phẩm mì ly khác, CayKay giữ nguyên cách ăn mì ly kinh điển: mở nắp, trút gói gia vị, chế nước sôi chờ trong 3 phút và tha hồ đổ mồ hôi, hít hà. Mì CayKay hương vị bò quyến rũ fan ngay từ sợi mì đầu tiên, sợi mì dai kết hợp cùng nước súp cay, CayKay sẽ là lựa chọn phù hợp cho những bạn trẻ thích tìm kiếm, thử thách sức chịu đựng của vị giác đó nha. Bao nhiêu bạn ở đây đã thưởng thức mì CayKay rồi nè? Tại nhà máy Acecook Việt Nam, môi trường sản xuất hoàn toàn khép kín và luôn đảm bảo vệ sinh nên không thể tiếp xúc với nguồn lây nhiễm ký sinh trùng. Đồng thời, trong công đoạn sản xuất, mì ăn liền phải trải qua các quá trình xử lý nhiệt như hấp chín sợi mì bằng hơi nước ở nhiệt độ 100 độ C, quá trình làm khô để giảm độ ẩm xuống dưới khoảng 3% bằng phương pháp chiên qua dầu hoặc sấy mì ở nhiệt độ cao khoảng 140 - 165 độ C. Ở điều kiện này, vi sinh vật và ký sinh trùng không thể tồn tại được, hoặc nếu có cũng sẽ bị tiêu diệt. Cuối cùng, sản phẩm còn được đóng gói trong bao bì kín để tránh các tác nhân gây ảnh hưởng đến chất lượng sản phẩm từ bên ngoài. Tuy nhiên, bạn cũng nên lưu ý, sau khi mua sản phẩm về, hãy nhớ bảo quản ở môi trường phù hợp theo hướng dẫn của nhà sản xuất có ghi trên bao bì để có thể yên tâm thưởng thức hương vị mì trọn vẹn nhất nhé. Nhiều người tiêu dùng chia sẻ, một trong những lo ngại nhiều nhất về mì ăn liền chính là sản phẩm này bị chiên đi chiên lại nhiều lần, và chiên lâu trong chảo dầu. Thực tế, với quy trình sản xuất hiện đại tại Nhà máy Acecook Việt Nam, những vắt mì chỉ lội qua chảo dầu 1 lần duy nhất với hệ thống chiên khép kín và liên tục trong thời gian tối đa là khoảng 2 phút 30 giây. Vì nếu thời gian chiên vượt quá con số lý tưởng này, vắt mì khi chế nước sôi vào sẽ không thể hoàn nguyên lại được như ban đầu. Bước 1: Tập trung ánh mắt cao độ để phát hiện các gói mì núp kỹ trong bếp. - Số gói mì bạn tìm thấy. - "Tọa độ" ẩn giấu. *Các khu vực không có hệ thống CGV, giải thưởng vé xem phim sẽ được đổi thành phiếu mua hàng có giá trị tương đương. Tìm ra mì - nhận quà thú vị, cả nhà còn đợi gì mà không tìm ngay Ninja Nu-đồ trước ngày 04/05? Bước 3: Comment hình ảnh bên dưới, share post hoặc tag thêm bạn bè để rủ chơi chung. Trước ngày 12/08, nhớ like và share mạnh tay để tranh thủ sự ủng hộ của bạn bè gần xa, tăng thêm cơ hội giựt quà. Hẹn gặp tất cả các fan tại ngày gọi tên người lên bảng vàng chiến thắng nhé! Perrier® carbonated mineral water was born in the south of France and has delighted people worldwide for more than 150 years. In order to officially launch Perrier's new limited edition - PERRIERXWILD, Perrier held a series of events in Ho Chi Minh City. Chỉ còn vài ngày nữa, tâm điểm PerrierXWILD sẽ chạm ngõ tại đêm tiệc ở Purple Jade - lầu 1 khách sạn Intercontinental Sài Gòn, ngày 26/10 tới. Hãy diện những bộ cánh thời trang nhất, sẵn sàng để cuốn mình theo những điệu nhảy disco sôi động tại đêm tiệc. Sự kiện có sự góp mặt của DJ nổi tiếng đến từ Mỹ và vô số những người bạn mặc chất - chịu chơi như bạn. Hãy đến và cảm nhận không khí cùng Perrier. 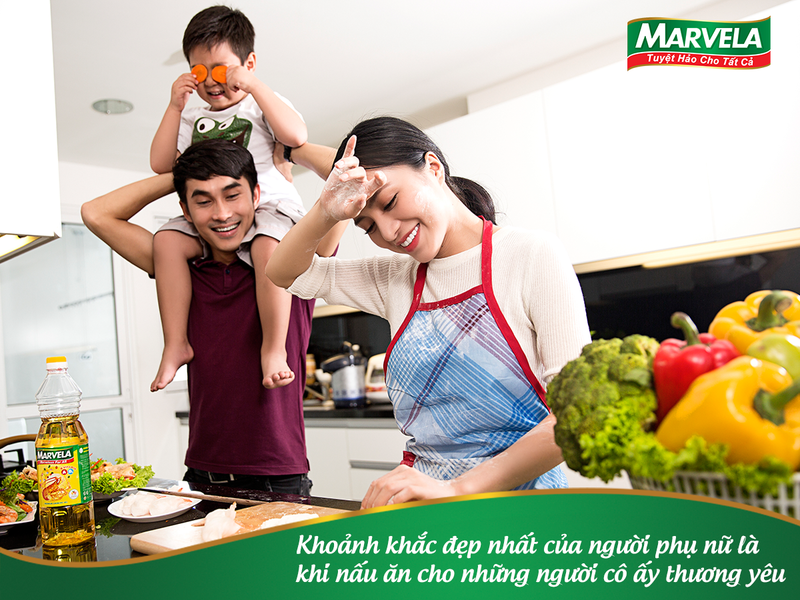 Perrier mở hội, không chỉ một mà còn hai. Tiệc một năm chỉ một dịp, sao có thể để bạn chill một lần rồi thôi? Perrier sẽ đem đến cho bạn một bất ngờ nữa trong đêm Halloween party tại nhà hàng Shri để tiếp nối chuỗi sự kiện giới thiệu bộ sưu tập PerrierXWILD. Hãy đón xem tại đây, trong vài ngày tới. Bước 2: Comment hình ảnh “độc lạ”, thể hiện phong cách dị nhất của bạn, thể hiện được cái tôi dị biệt như cô nàng trong ảnh. Tag thêm 3 người bạn tham gia thử thách để tăng thêm cơ hội chiến thắng. Đừng chần chờ, chứng tỏ mình dám làm nào. We create a content plan to activate Perrier fanpage in Vietnam again by leveraging the concept "Go for the extraordinaire". 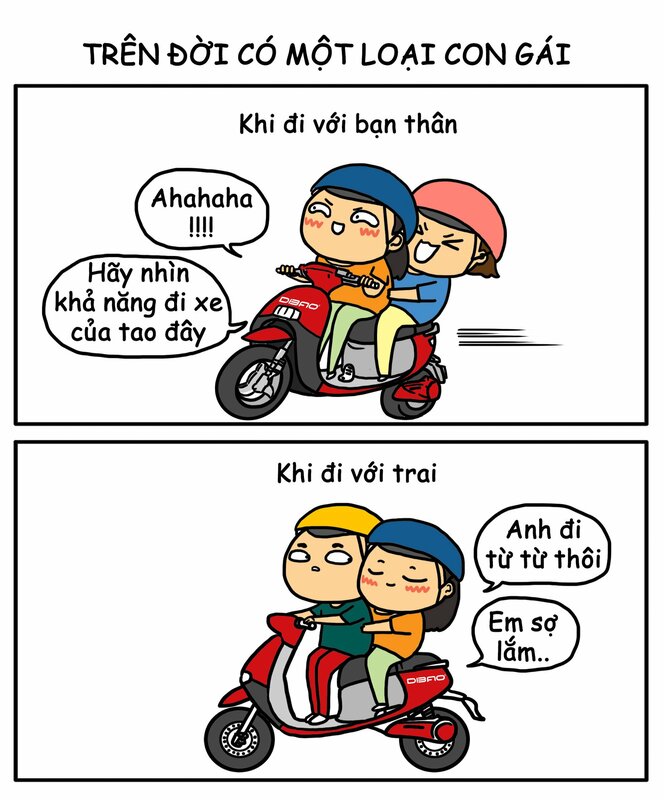 Không đứng đầu nhưng “cool ngầu” giữa đám đông. Không là sao nhưng luôn toả sáng. Dù lê la phố phường hay về nhà tận tưởng, dù ở đâu Perrier cũng luôn luôn nổi bật. 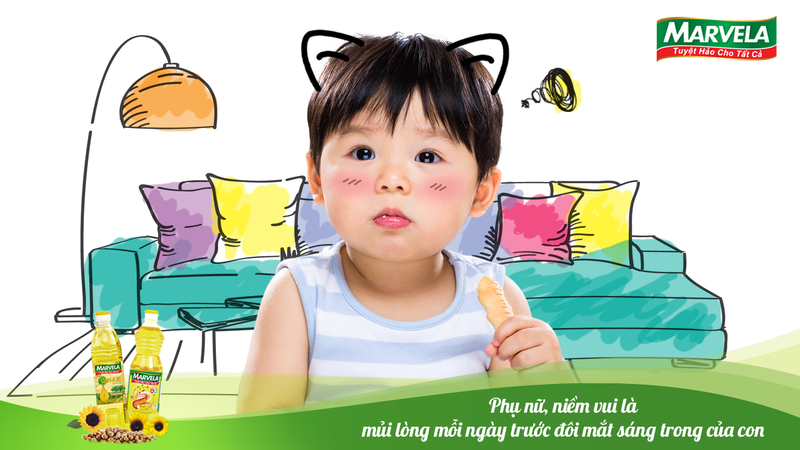 0% calories, 0% đường, là một, là độc tôn, là duy nhất, là Perrier! Từ những chai nước khoáng đầu tiên ở mạch nguồn Vergèze miền Nam nước Pháp đến hàng triệu chai Perrier trên thế giới. Hai thế kỷ, hơn 150 năm, hàng trăm quốc gia, hàng triệu người thưởng thức, vẫn giữ một hương vị vẹn nguyên. Thưởng thức nguồn nước khoáng thiên nhiên, thưởng thức Perrier. Một chai nước khoáng có gas Perrier ướp lạnh, một chút trái cây tươi mát hòa lẫn trong thức uống detox mà bạn không thể chối từ. Sự kết hợp trên mang lại thức uống detox lợi hại hơn gấp nhiều lần nhờ hàm lượng carbonate cao có trong Perrier giúp tăng hiệu quả quá trình hấp thụ vitamin trong hoa quả. Nguồn nước sạch cho sức khoẻ xanh, hãy nhấp một ngụm detox tạo thành bởi Perrier và cảm nhận sự tươi mát. Hơn trăm năm có mặt, Perrier chỉ thay đổi đúng một lần: thay đổi mở rộng diện tích yêu thích từ nước Pháp ra toàn thế giới. Đã vào cuộc chơi thì phải thật máu lửa. Uống Perrier tiếp sức vực dậy tinh thần, xua tan mệt mỏi để sảng khoái chinh phục môn thể thao ưa thích của bạn. Nếu bạn từng thưởng qua vị Perrier, hãy thả tim, kể câu chuyện về ấn tượng ấy. Nếu chưa, đặt nhẹ icon cười và để lại một ấn tượng bất kỳ về người bạn trong hình. Dù thử hay chưa, comment hay là sẽ có cơ hội nhận chiếc túi tote phiên bản đặc biệt giới hạn từ Perrier. Comment ngay, nhận quà chất, có tâm là có phần.